Kevin works for Miccostumes.com, a shop supplying cosplay costumes like Naruto Cosplay costumes. He's also busy with running his cosplay blog. He loves talking cosplay and anime on his facebook and twitter accounts, so be sure to friend him. Sometimes fake wounds, scars or scratches are needed in your cosplay work. Today, we plan to focus on this and enrich a cosplay journey by vivid incised wound. Then, how to make a fake cut for cosplay? Step 1. Wash your hand. Step 2. Find a piece of tissue and tear it into desirable size. Just make sure they are not too large. Step 3. 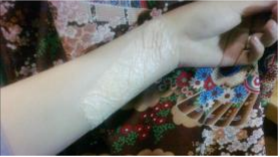 Place tissues flat on your hand and glue them by latex. When the latex begins to dry, put one more piece of tissue on the latex. Repeat this until the thickness meets your requirement. Step 4. Wait until tissues and latex dry and then wipe a tier of foundation make-up on it. Be careful and don't destroy the shape on the tissues. Step 5. Daub brown, purple and red eye shadow on the wound. Step 6. Draw a gap in the middle and lift the edges. Size of the gap depends on your favor. Step 7. Dip blood plasma or red ink into the cut. Well control and adjust the volume while dipping. Step 8. Finally, the cut looks like this. Step 9. 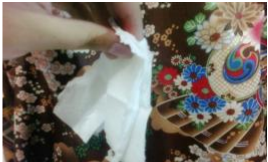 If more tissues are used, or the gap is widened it will look like this. Simple and vivid, right? It will be useful especially when you're on a budget.